Dynamic resistance occurs when muscles and joints move, such as when you raise and lower a hand weight. With isometric resistance, your muscles tense and create force but no movement, such as when you push against a wall. 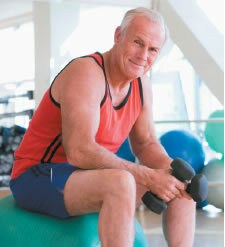 Boosting your muscle mass may trigger changes that enhance heart health. When you do aerobic exercise—brisk walking, biking, or swimming, for example—you breathe harder and your heart beats faster. This "cardio" workout provides a wealth of cardiovascular benefits. But you might not realize that strength training—also called weight training or resistance training—is also good for your heart. "Strength training maintains and may even increase muscle mass, which people tend to lose as they age," says Rania Mekary, a visiting assistant professor of surgery at Harvard-affiliated Brigham and Women's Hospital and assistant professor at MCPHS University. Boosting your muscle mass speeds up your metabolic rate, so you burn more calories—even when you're not exercising. Burning more calories helps you avoid weight gain, which keeps your heart healthier than if you pack on pounds. And strength training may be especially important for keeping off belly fat. This so-called visceral fat, which surrounds your internal organs, is particularly dangerous for your heart. Mekary and colleagues at the Harvard T.H. Chan School of Public Health found that healthy men who did 20 minutes of daily weight training had less of an age-related increase in abdominal fat compared with men who spent the same amount of time doing aerobic activities. Changes within muscles seem to promote these benefits. Muscles store glycogen, a molecule that breaks down into glucose (sugar) to fuel strenuous activity like weight lifting. After a workout, your body gets busy restoring that glycogen and has to rely on fat as an energy source, says Mekary, who is also a professional fitness instructor. Strength training also increases the number of mitochondria, the energy-burning structures inside cells. Other research shows that strength training can help control blood sugar levels by drawing glucose from the bloodstream to power muscles. High blood sugar is the hallmark of type 2 diabetes. Building more muscle mass also makes the body more sensitive to the effects of insulin, the hormone that regulates blood sugar levels. Another Harvard study found that men who do at least 150 minutes of strength training per week cut their risk of type 2 diabetes by about 34%. Diabetes raises your risk of cardiovascular disease, as does high blood pressure—another condition that strength training appears to improve. A review article that compared aerobic training with different types of resistance training found that all of these types of exercise helped reduce blood pressure. Speak to your doctor before starting a weight training routine, as the activity will challenge your heart. It's best to find a supervised program—through a senior center, at a health club, or with a physical therapist—to learn proper form, which is key to avoiding injury. Strength training can be done with resistance bands, small hand weights, or weight machines. A well-rounded program works all major muscle groups: legs, hips, back, abdomen, chest, shoulders, and arms. Start by warming up for a few minutes by moving your muscles without weights, and don't forget to stretch at the end. Aim for one or two sets of eight to 12 repetitions of each exercise, using a weight or resistance that's challenging but manageable. You can find more detailed information in the Harvard Special Health Report Strength and Power Training: A guide for older adults; see www.health.harvard.edu/SPT. Blood pressure can soar to dangerous levels if you hold your breath while performing strength exercises. Be sure to always exhale as you lift, push, or pull, and inhale as you release. If you find yourself grunting or getting stuck in the middle of a lift, you're using too much weight. Decrease the amount of weight to stay in a safe zone. pain in bones or joints. If you have a chronic health condition, such as heart failure or a heart rhythm disorder, ask your doctor if you should be alert to any additional symptoms. Keep a record of them—whether that's in a note on your smartphone or on a slip of paper you carry in your purse or wallet.